The Abstract Expressionist New York exhibition at the Art Gallery of Ontario (AGO) is a stellar collection of works by some of the better known artists of the art movement. Of course there's nothing to replicate a visit to the Museum of Modern Art in New York to experience the paintings in their home. But the AGO's exhibition provides viewers with an an excellent look at Abstract Expressionism. The Jackson Pollock works will surely be an attraction because he's such a famous painter synonymous with the drip technique as seen in Number 1A, 1948. The technique gave Pollock a way to create and interact with the canvas and paints by dripping, pouring and splattering in dance-like movement. 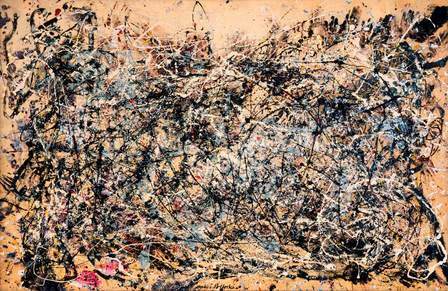 Look for the Pollock's hand-print autograph in the top right corner of Number 1A, 1948. The Pollock works were wonderful to see. But don't miss the works by Barnett Newman, Willem de Kooning, Clifford Still, and Mark Rothko. Watch for my blog post on Rothko coming soon.